Open adoption can mean different things for different families. Parents should consider their child's needs when deciding on an open adoption. But when Robbie was about three years old, Kim recalls, “Tony literally disappeared. And it just about crushed me.” Kim wondered where Tony was and whether she was alright. Robbie, too, wondered aloud why his birth mother didn’t call or write. Tony did resurface a few years later, and Robbie spoke to her on the phone. He asked her to write, but no letter ever came. The empty mailbox is just one example of the challenges that families in open adoptions may face. In recent years, we have embraced the concept of open adoption with gusto — yet the journey, for some, has proved to be unexpectedly bumpy. Lack of support, a sudden change in the life of either the adoptive or biological family, logistical pressures — all can complicate matters. Add to that the emotionally charged issues at stake-parenthood, power, identity — and open adoption can make for some combustible family dynamics. To be sure, open adoption gets rave reviews from the many social workers and families who champion it. Since the mid-1970s, open adoptions have been widely accepted as more compassionate and enlightened than the secretive adoptions of a previous generation. Indeed, the confidentiality that once defined adoption is no longer the norm. While international adoptions remain mostly closed, as do many public agency adoptions, domestic adoptions increasingly involve contact between adoptive parents and birth parents. The good news is that recent research debunks many of the myths that once stigmatized openness. Children in open adoptions have no confusion as to who their parents are, and birth mothers do not have trouble moving on. If anything, openness appears to help kids understand adoption; relieve the fears of adoptive parents; and help birth mothers resolve their grief, according to researchers Harold D. Grotevant and Ruth G. McRoy. “Many of the fears about open adoption do not seem to be a problem,” said Grotevant, a professor at the University of Minnesota and co-author with McRoy of Openness in Adoption: Exploring Family Connections. For many families, open adoption remains controversial and misunderstood. Even among experts, definitions of “open adoption” vary wildly. In its simplest sense, an open adoption is one in which the adopting parents and the birth mother (and possibly the birth father) have some form of contact, directly or through an agency or lawyer. At one extreme are the families who exchange letters and pictures but have never met. At the other are the children whose adoptive and birth families socialize at least once a month or more. Most open adoptions lie somewhere in the middle, according to Grotevant and McRoy, exchanging letters, pictures, and phone calls, and having face-to-face meetings once or twice a year. Whatever their situation, many families report that relatives and friends condemn openness, and voice fears that the arrangement will make the birth parent want the child back. Carly’s father, Doyle, knows about closed adoption firsthand: he was adopted and didn’t find his birth parents until he was 33. “He certainly wanted Carly to know more about her background than he did,” said Jill. Carly talks on the phone with her birth mother, exchanges pictures and letters, and sees her about three or four times a year. She has also had several visits with her birth father. Last summer, Carly was a flower girl in her birth mother’s wedding. For children in open adoptions, the toughest challenge may come when a birth parent who’s been visiting or calling suddenly vanishes or drifts away. The trigger can be a move to a new job, a marriage, or a personal problem, such as drugs or alcohol. In some cases, a birth mother may not feel worthy of contact, or she may get the message from the adoptive parents that she’s not welcome. Laura Miller, of Long Beach, California, was committed to an open adoption for her now 13-year-old son, in part because she had seen her adopted brother suffer from lack of knowledge. But Miller has had to work hard to keep her son’s birth mother in their lives. Experts say that some social workers initially pushed open adoption as a benefit to birth mothers. This turned out to be a mistake. Occasionally birth parents experiencing shame or sadness just have to retreat for a while. In rare cases, when safety is an issue, adoptive families may have to cut off contact. A child whose biological parent disappears experiences a double whammy. He wonders why he was placed to begin with, then feels rejected again because a birth mother no longer visits. Adoptive families who have lost touch with a birth parent should establish contact with other members of the child’s biological family if they can, such as birth grandparents, Roszia suggested. In the early days of open adoption, Roszia noted, the conventional wisdom was that adoptive parents would be the ones to drift away. That has not turned out to be the case. “I think the people who have disappeared most often have been the families of origin.” she said. Roszia and other professionals advise families to be flexible, to recognize that all family relationships change over time. What worked for a child at infancy may not work when that child starts school or enters the middle years. “When kids begin to understand reproduction, they may become sad to realize that their adoptive mother is not the one who gave birth to them,” said Romanchik. It’s important for adoptive parents to validate those feelings, she noted, without anxiety that they are somehow betraying the birth mother. Parents may also wonder how to react when kids start voicing their preferences regarding birth parent contact. Letting a young child call the shots in an open adoption is probably a bad idea. (After all, small children don’t get to decide when to visit grandparents or other relatives.) But a child of 12 may be ready to make some decisions about whether or when to meet with birth parents. “The older a child gets, the larger the role they should have,” Grotevant advised. Things can also get tricky if a child’s adoptive and biological parents have different values or expectations. Karen Chavoie had to bite her tongue recently when her 13-year-old daughter, Kendall, came back from a shopping trip with her birth mother, Stefani. A generation gap played a role. Chavoie is 47, her husband, Rob Holliday, is 45, while Stefani is 28. (She gave birth to Kendall at age 15.) As do many adoptive parents, Chavoie and Holliday took on something of a parental role with their daughter’s birth mother. This was not always easy, Chavoie acknowledged. If adoptive parents end up “parenting” a birth mother, too, she may eventually push them away, and this could hurt the child. Conversely, it may not be appropriate for adoptive parents to confide to a birth mother about how their child is grappling with adoption. Most importantly, experts say, biological and adoptive parents must remember that open adoption is about meeting the needs of children, not adults. Openness does not simply wipe away the feelings of grief, fear, or insecurity that can swirl around an adoptive placement. Now that the first open-adoption generation is under way, social workers are becoming more aware of the role of siblings in these arrangements. An adoptive child’s relationships with biological siblings need to be taken into account. And two children adopted into the same family may have different degrees of openness with their birth mothers. Openness may also affect decisions about family size. Sue and Dean Heinzman, who live in Maryland, are huge fans of their son’s birth mother, Carly. 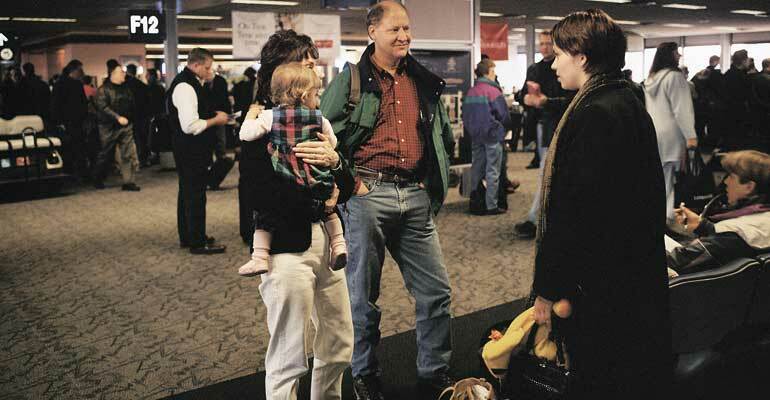 The Heinzmans and their son, Ben, now three, socialize regularly with Carly and her extended family. Yet that very closeness has made a second domestic adoption seem daunting to them. Sue Heinzman’s enthusiasm for openness was echoed by virtually every family interviewed for this story. Even Kim Felder, whose empty mailbox made her son so sad, would not have it any other way. Robbie is one of four children adopted by the Felders since 1987, all of them involved some form of openness. And Kim knows the pain of closed adoption firsthand: she placed her son, Jim, for adoption 24 years ago, reuniting with him when he was 18. It's not that she doesn't care, it's that life takes ..
Parents involved in open adoptions speak honestly about working through ..
An open adoption arrangement may be buffeted by passing time ..
After three domestic adoptions, we have three very different levels ..